I've been fascinated by HoB's design since the first trailers I've seen. I collected as many wallpapers as possible, I've done style analysis, but unfortunately, I had no hardware compatible with the game ... that is, until I logged in the Nintendo shop last week and discovered a promo on HoB definitive edition! I think I haven't played a game that intensely since Fez! About every moment in the day, I could feel slight excitation about getting back to the game when I'll be done with the day's tasks, exactly the same way you feel excited about continuing to read a Harry Potter book for the first time. 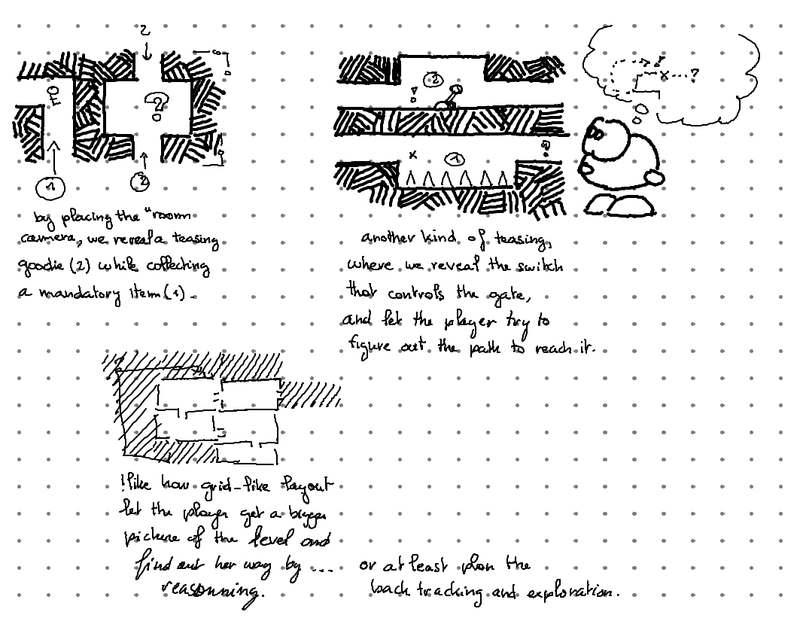 The core difference with Fez is that I had no need for a journey log nor to scribble everything I encountered. 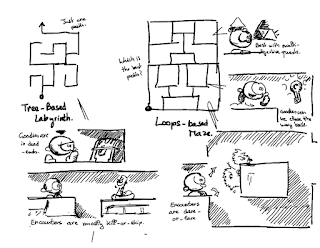 As surprising as it is, I could keep all I had to know about HoB's world in my head -- partly thanks to the icons feature on the map that will automatically pinpoint collectibles the minute you have them onscreen, so that you can track and collect them later on. I should mention that I played the game in "normal" mode, not in "definitive mode" (which would have provided more signposting and hints about quests, if I'm correct). I used the map a lot, and I found it interesting that only the overworld has a map, and that I got a different feeling when entering a cave where I would have to rely solely on my brain to know whether I've visited a room already and never know how far away I was from the exit. 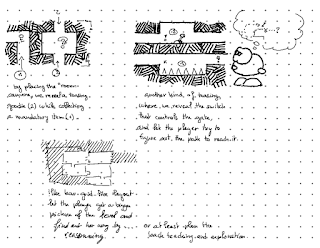 I'll keep the game design analysis for other posts. I must confess that I did encountered some glitches while playing: mostly walls disappearing when the camera angle got too extreme, but also getting stuck into trees where I wasn't supposed to be ... The game even crashed once, which I really wasn't expecting on a console system. But let's be honest: compared to the huge amount of bugs PS and PC users reported at game launch, that Switch version is clearly much cleaner. I was also stunned to see the game lagging that much on earlier releases. 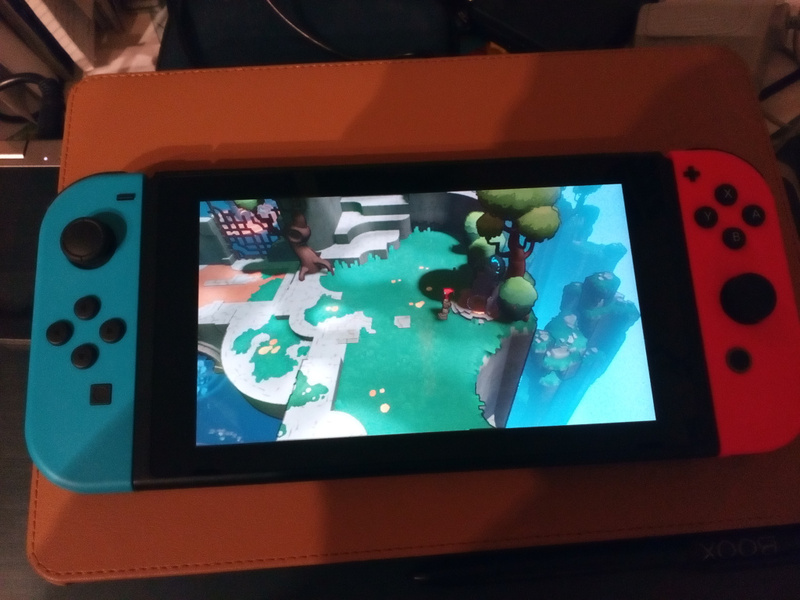 The switch port seemed to run at full frame rate most of the time. I don't recall I had to blame lagging for any missed jump or failed fight. Je me refaisais un longplay de shantae pour voir un peu quel genre de level design a été utilisé dans les phases "face-à-face avec les monstres". Et comme je viens de travailler sur la perspective de Bilou dans sa pyramide les blocs m'ont sauté aux yeux. Dans certaines zones, on a bel et bien une perspective 3/4 sur certains blocs (comprenez, la face avant du bloc est trois fois plus grande que la portion d'écran réservé à sa face supérieure -- j'ai noté ça 3:1 sur l'image). Dans d'autres salles (la plupart du donjon, en fait), on est avec un à-plat parfait. Enfin, le monde extérieur, lui, est plutôt en perspective 2/3 (un cube aurait une face supérieure qui occupe moitié moins de pixels à l'écran que sa face avant), ce qui se traduit par un rapport 2:1 pour la face supérieure assez flagrant pour les objets cylindriques ... et qu'on retrouve notamment dans les grandes fleurs de certaines salles du donjon de la forêt. Je note aussi que ça m'avais complètement échappé quand j'ai étudié les graphismes du jeu, donc il est probable que ça n'ait choqué qu'une infime proportion d'architectes pendant leur partie. 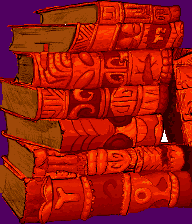 Après un troisième round, il était temps que j'exporte les petits pixels actuels de la pyramide avec Bilou dedans ... Il faudra aussi que je prépare un niveau de test, histoire de vérifier que Bilou bouge bien dans ce décor-là. 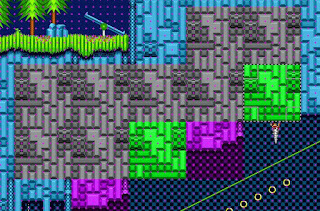 I'm far from being done, but I've got now invested some more time pushing pixels for the pyramid zone, the next environment planned for Bilou's games. So it was time to pull the SD card out of my linker and make a backup of all this. Enjoy. It is not too noisy with its fans, gets a jack output and can easily fit next to the HiFi system. 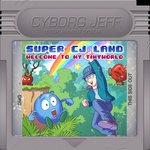 I can use the WiFi connection to quickly view which song is being played, skip to the next song and switch between "fairy-lover" or "chiptune-lover" modes, from any device in the house including smartphones and tablets. I would still need to let it learn which songs are less liked, or migrate some titles to other folders, etc. Preferably in a way that would not take effects immediately, but rather that is approved over ssh after having been collected during play sessions. Fairy's laptop still has a battery. Mine is now powercord-tied to the ground. 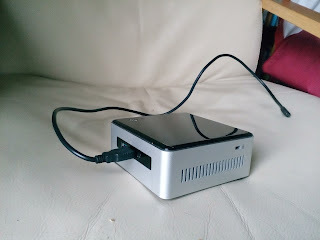 Fairy's one has poor resolution but increase mobility, but Fairy's one isn't always there, so it would be better to use it just as a remote terminal to the NUC instead. That means having it a mercurial hub with improved features. I use to have something like "nohup hg serve --webdir-conf /path/to/hg/hgweb.config -p 5555 &>/dev/null &" at work, where hgweb.config is simply a list of 'printname = full/path/to/repository', where printname may be 'organizational-folder/repository-printname'. 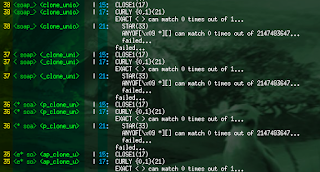 It all falls under a [paths] section of an INI file. 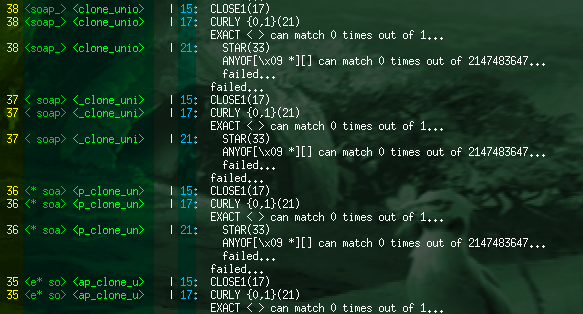 But I'd like it to try building and generating documentation whenever I push a new set of commits there. The ultimate goal is being able to browse up-to-date code from my boox without having to power up a laptop. 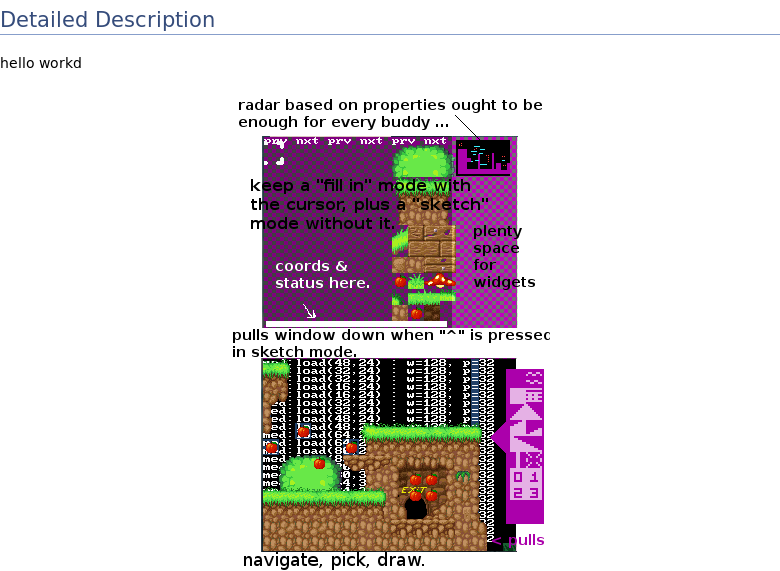 That will also help integrating all sort of support pictures like screenshots and UML diagrams into the documentation. and html class pl-video-title-link allows to identify all the links to the mentioned videos. and there is a tag in youtube pages! That will be for when I got it plugged into a wired network again: I don't know whether this is due to the extra disk enclosed in the device, but the WiFi connectivity is a nightmare. I get a few 100Kbps at best ... barely enough to use a remote terminal. I'd rather not start installing big things that way. 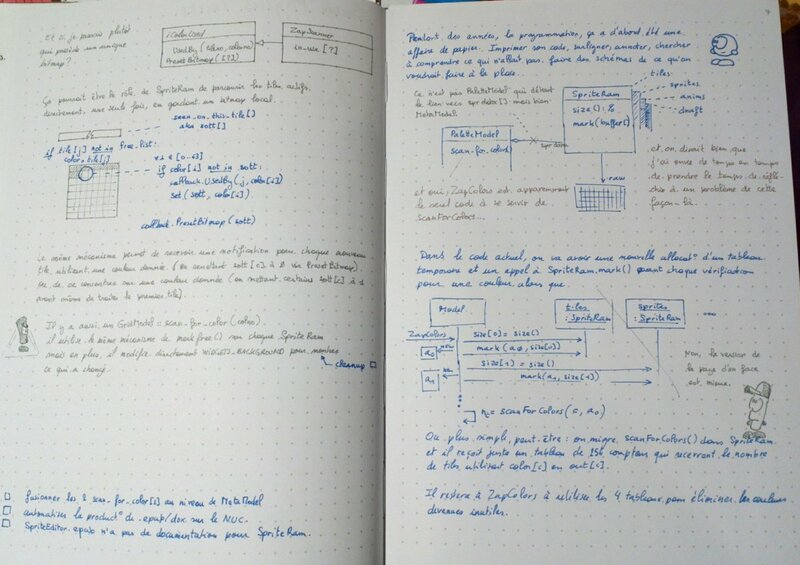 Mes cogitations pour rénover la gestion des maps dans mon moteur DS commence à porter ses fruits, au point que je peux commencer à réfléchir à l'impact que ça aura sur l'éditeur de niveaux. 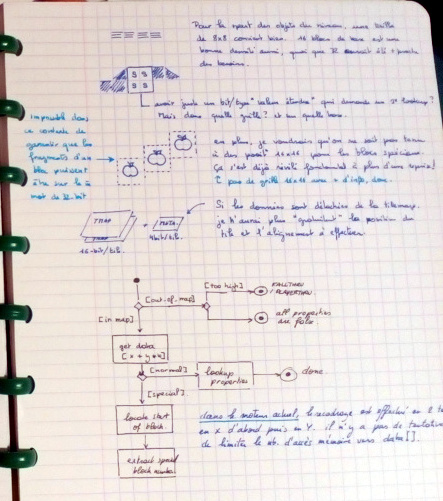 ça me tient à coeur parce qu'avec le système actuel, je ne vois de bonne solution pour réaliser les cours d'eau souterrains que mon frère avait mis dans les niveaux historiques de la Grande Aventure. 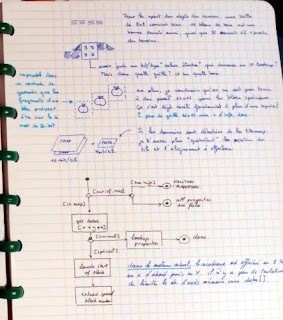 ça signifie que la petite palette de blocs utilisée dans LEDS va devenir plus complexe, avec un bouton "montrer les autres options", et que je pourrais bien en avoir trois tranches plutôt qu'une seule pour éviter les opérations de navigation fastidieuses. Avec cette pyramide, j'entre dans l'inconnu, moi aussi. 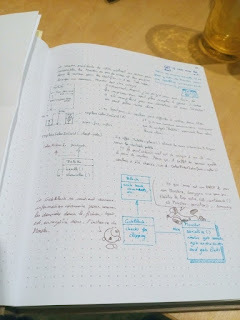 On a jamais dessiné aucun niveaux, on a jamais vraiment fait de 'monster design', à part quelques Bilous couverts de bandelettes (momificum, momificus et momificae, de mémoire) et une sorte de robot affublé d'une caisse en guise de tête et baptisé "Toutencarton". Tout est à faire. 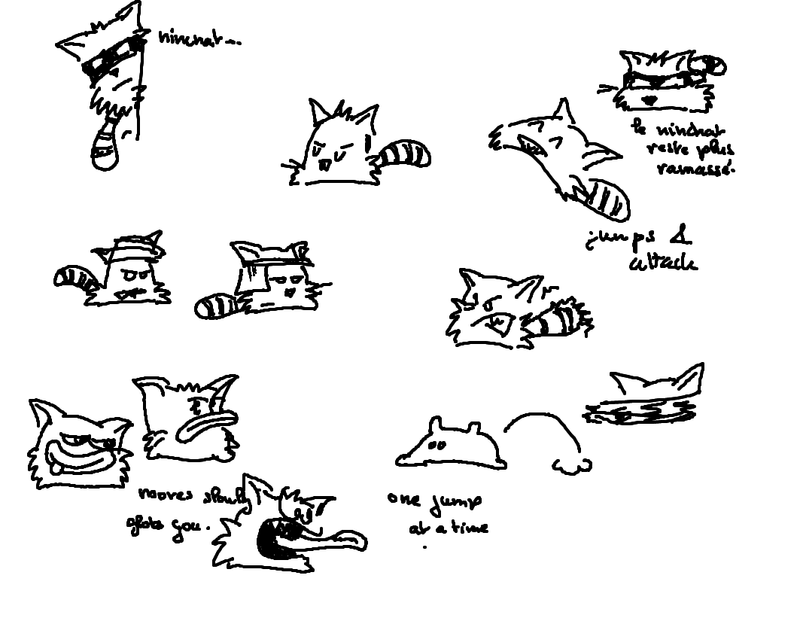 Alors après avoir un peu cogité le graphisme de super cat adventures et regardé J.l.n affronter les bêbêtes à poils de Kirby Squeak Squads, je me dis qu'une sorte de chat-ninja pourrait être sympa. Il faut qu'il soit Bilou-style, bien sûr, d'où l'absence de pattes. Il faut aussi qu'il ait des mouvement intéressants, d'où l'utilisation de la queue rayée comme d'une patte en cas de besoin. Oh mazes. Amazing Mazes. 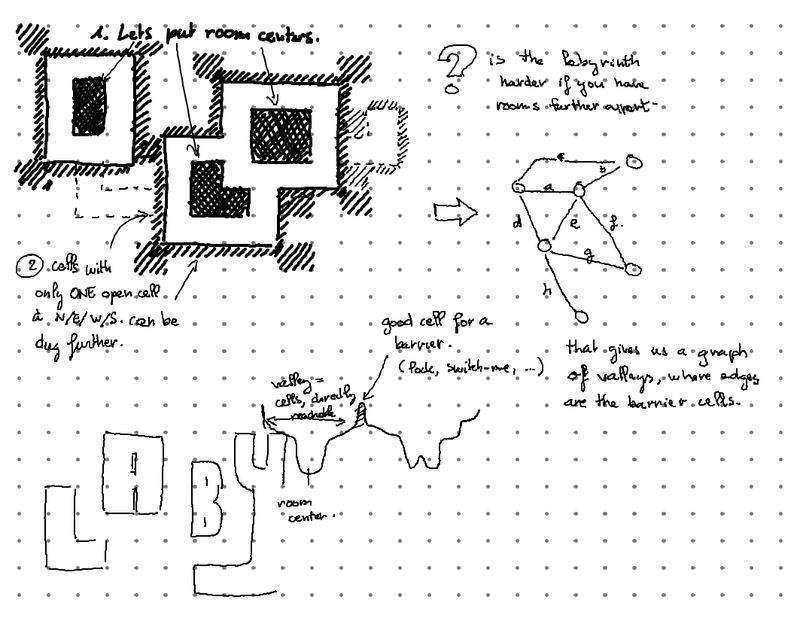 I quite love maze games, and as you may have guessed, I would like to delegate parts of the level design of my next game to a maze generator. 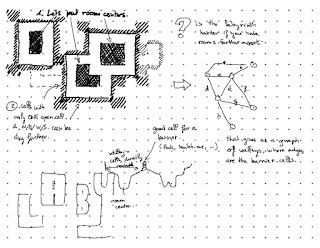 I've written a few of them so far, including some that needed little resource, but most of them were creating so-called "perfect" mazes, where two locations in the maze are always linked by exactly one path . Bon, j'aime bien les labyrinthes. Depuis longtemps, et j'aimerais bien que le prochain jeu de Bilou puisse se dérouler dans un niveau plus labyrinthique. Mais j'ai envie d'y jouer moi-même aussi, du coup ce serait sympa si le jeu pouvait partir d'un générateur de labyrinthes et les maquiller en niveaux de Bilou. Par contre, tous les générateurs de labyrinthes que j'ai fait (ou fait faire) jusqu'ici produisaient des labyrinthes parfaits, c'est à dire des labyrinthes dans lesquels il n'y a jamais qu'un et un seul chemin entre deux endroits. Et du point de vue du gameplay, j'ai peur que ce soit loin d'être génial. Imho, this is not ideal for gameplay. 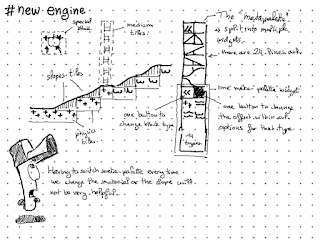 It creates maps that are essentially trees, with lots of dead ends and narrow hallways. 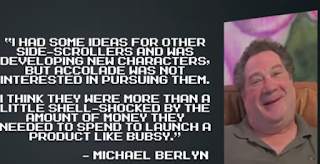 I believe it will reduce many of the gameplay opportunities. it means that you can hardly dodge monsters. In some way, in such mazes, you hardly have any real choice once you stop seeing it all: you merely guess which might be the correct path and turn back a lot. I have the feeling that interconnected loops will provide more interresting behaviours. 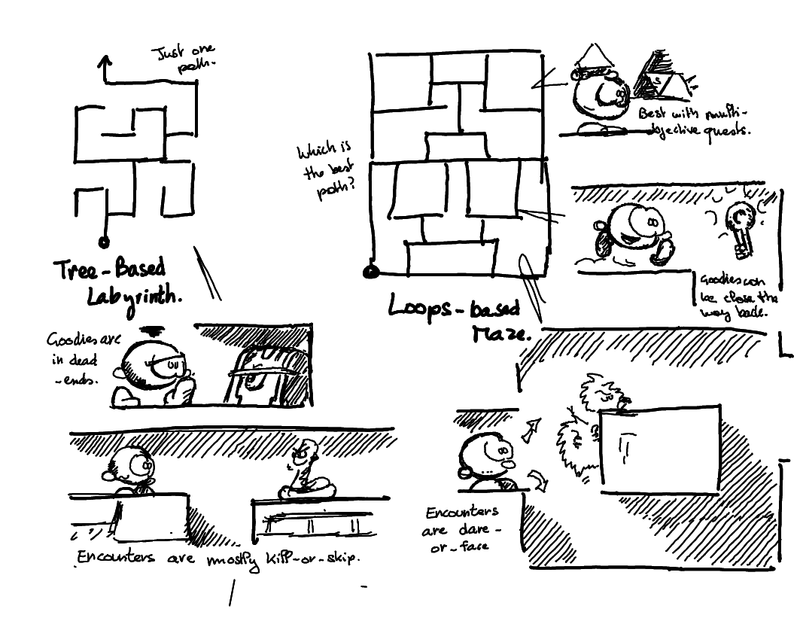 we see them in PacMan - as well as in Phantom Hourglass. They provide interesting backtracking and let you chose between fighting or sneaking when you encounter a monster. Parce que s'il n'y a qu'un seul chemin, ça implique qu'il y a de nombreuses voies sans issues. Sans une vue globale de la situation, il est extrêmement improbable de parvenir à "trouver" son chemin, et donc pas de réel choix à faire pendant la navigation. En plus, la plupart des obstacles ne pourront pas être contournés: ou bien on les affrontes, ou bien on ignore le chemin sur lequel ils se trouvent. Bref, mieux vaudrait un environnement proche d'un niveau de pac-man, avec de nombreuses boucles, où le défi est moins de trouver le chemin que de choisir celui qui offre le meilleur rapport récompenses/risques. So how can I make levels than feature such loops? I gave it another try this week-end, by first laying out loops of random size on the map, making their center "unbreakable" and then setting the rest of the map as cells ready to be processed by a regular "perfect maze" algorithm. But this time, I do not need to push the execution to the point where the maze becomes all-connected. Instead, it is sufficient that all rooms get connected. Some cells will then remain obstacles, which I'm fine with. Je n'ai pas encore d'algorithme idéal pour ce genre de labyrinthe. 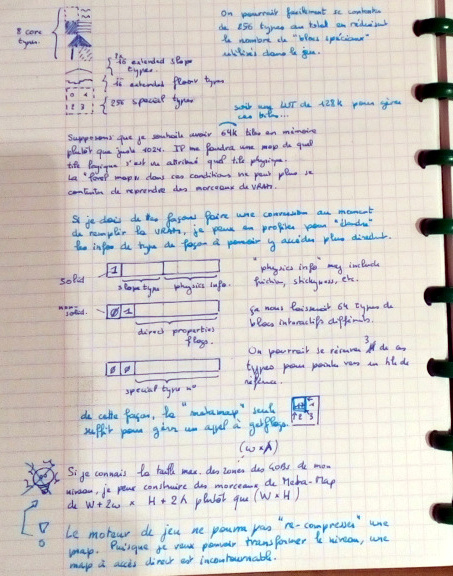 Je fais quelques essais sur papier quand j'ai un peu de temps les week-end... Une des idées serait de commencer par créer un certain nombre de boucles de ce genre dans une grille avant d'y faire tourner un algorithme de "labyrinthe parfait" sur les cases restantes jusqu'à ce que toutes les boucles se retrouvent inter-connectées. 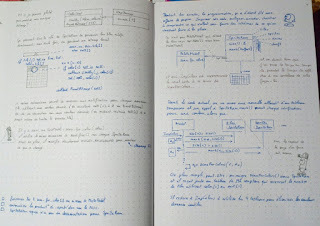 bon, je voudrais réintégrer une partie des images de ce blog à l'intérieur de la documentation Doxygen pour avoir un document de type "e-book" un peu plus complet. C'est particulièrement le cas avec les screenshots d'interface graphique pour les éditeurs, parce que redessiner les positions des boutons quand je veux comprendre pourquoi certains ne s'activent pas à chaque fois, ça devient vite lassant. 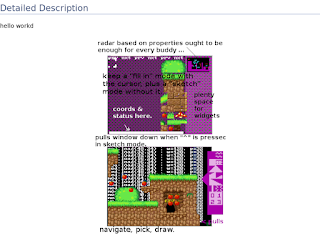 j'ai déjà fait un essai avec un fichier pour libgeds, qui s'était rangé dans 'pixdox/html' et qui était invoqué avec un \image html InspectorWidget.png dans InspectorWidget.cpp, moyennant IMAGE_PATH=pixdox dans le fichier Doxyfile pour libgeds... reste à faire pareil pour les autres. edit: oui, pendant quelques jours, ce post a bloqué tout le reste du blog. La faute à un copier-coller trop aggressif qui s'est terminé par une image encodée directement en base64 dans le post... J'imagine que les buffers de google n'ont pas apprécié. Ok, au départ je cherchais des références pour les couleurs et le style de la "desert/pyramid zone" de mon prochain jeu. 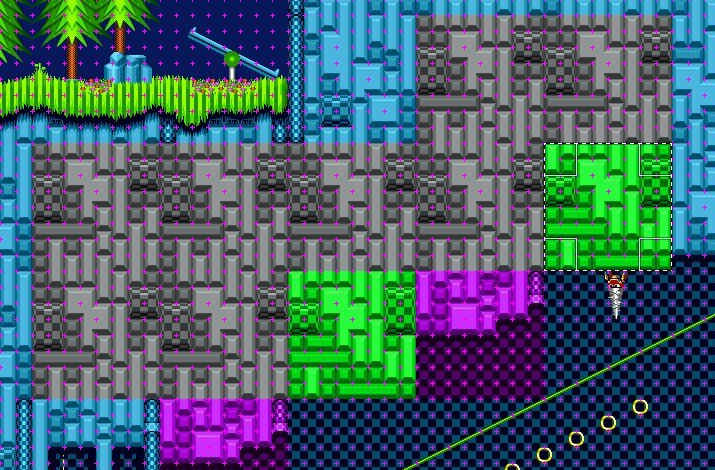 Et je venais de découvrir l'existence de Sandopolis, région d'un jeu Sonic jusqu'à laquelle je ne suis probablement jamais allé. 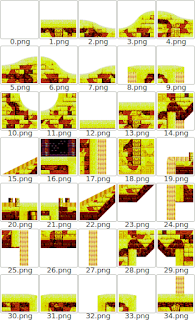 Un beau gros .zip dans lequel était supposés se trouver tous les décors, mais au lieu d'une "tilesheet" habituelle, je tombe sur une collections d'images de 128x128 pixels. J'étais resté un peu intrigué mais sans plus. 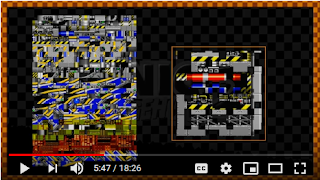 Puis en revoyant la vidéo "making of Sonic 2" de splashwave, le doute n'est plus possible: il y a un niveau intermédiaire de map, et ces blocs de 128x128 pixels sont bels et biens des morceaux de puzzle construit à la main pour servir ensuite de de bloc de construction dans un niveau. On peut atteindre ainsi un taux de compression proche de 100 pour 1. 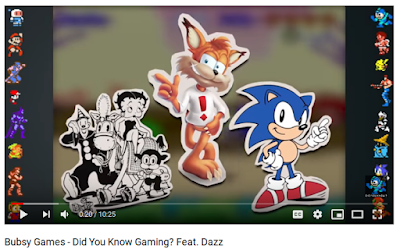 Les niveaux de Sonic avec leur taille surréaliste de 10,000 x 2,000 pixels tiennent en réalité dans moins de 64K de mémoire. On va les appeler des "mega-tiles". Et si on regarde un niveau construit avec suffisamment de recul, on peut commencer à trouver des correspondances. 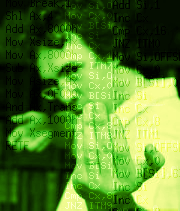 Commencer seulement, parce que c'est loin d'être complètement évident ... et j'aurai eu recours au mode "soustraction" de Gimp pour les mettre en évidence. Et si on ne s'en rend pas compte en jouant, c'est grâce aux différents éléments qui eux ne font pas partie de ces blocs : les télévisions, les anneaux, les ennemis ... 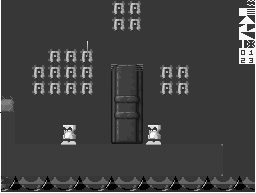 Et parce que contrairement à un jeu "type Mario", la disposition des blocs de taille 16x16 au sein du jeu a nettement moins d'importance. J'entends par là que Mario interagit avec un bloc de brique ou un bloc-question individuellement. Et le fait qu'un saut soit possible ou non se décide à un bloc près. 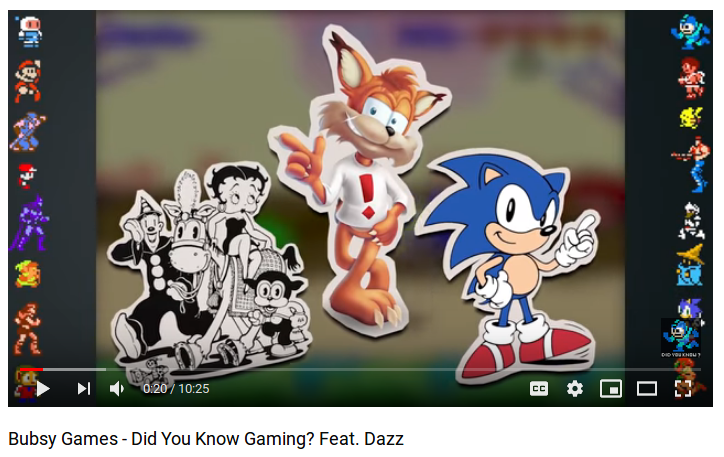 Pas dans Sonic. Selon qu'on va plus ou moins vite, on passe ou non. Selon qu'on trouve le bon bumper ou non, on va assez haut. Et quand on n'est pas assez haut, il y a de toutes façons une route inférieure à suivre. Bon, soyons clairs: être sur un PC - un vrai, avec une souris, un clavier, une connexion réseau et un écran - ça ne m'arrive plus qu'au bureau. La bricole homebrew, ce sera de temps en temps sur le laptop ... avec tout ce que je peux préparer hors-PC hors PC. 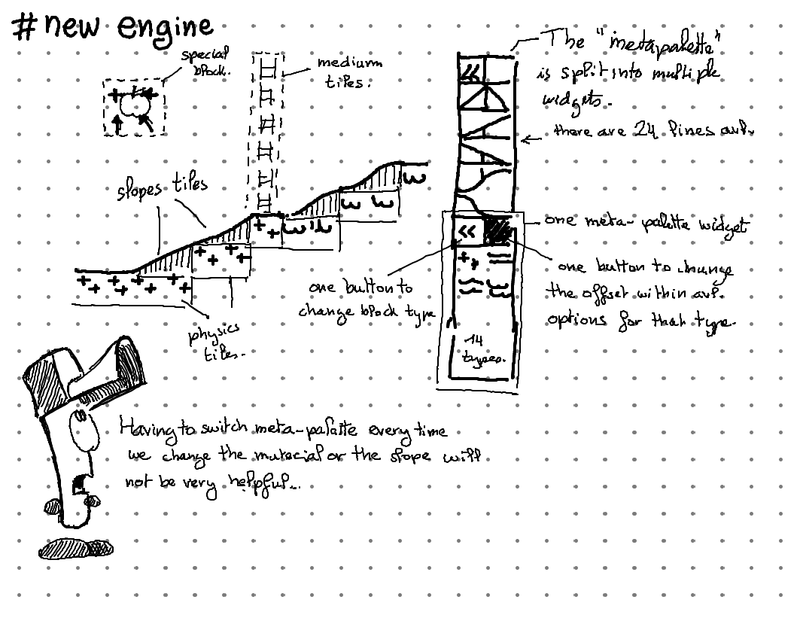 Le "engine design" dans un cahier atoma -- pour pouvoir mettre en vis-à-vis les idées et leur conséquences -- la documentation UML dans un cahier A4 quadrillé à spirale, etc. 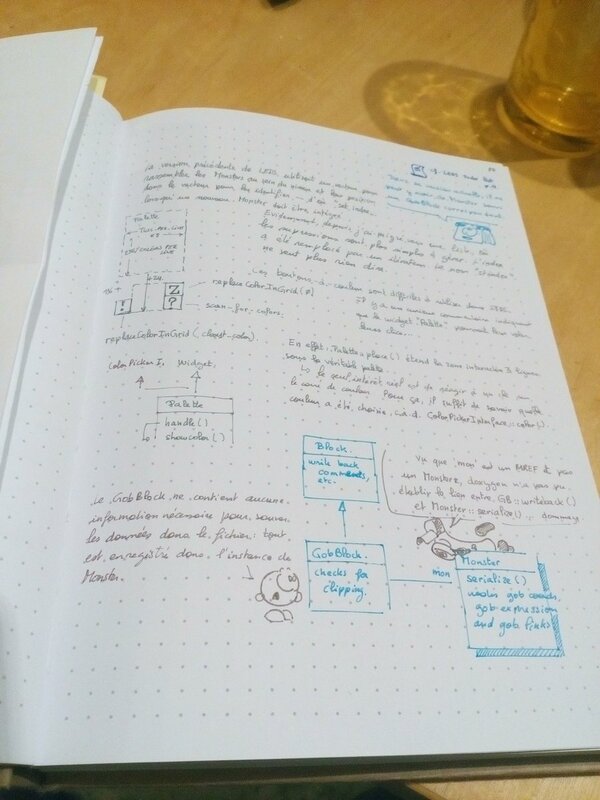 J'ai même tenté une sorte de 'bullet journal' pour suivre ce qui devait aller sur le blog, les posts en standby etc, qui est tombé plus ou moins dans l'abandon depuis que je me suis installé Wordpress sur mon Boox. 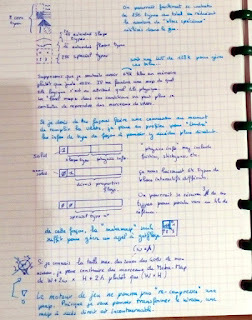 Et depuis cette année, je me suis trouvé un super petit cahier pointillé à la fin duquel j'ai écrit "proudly powered by CreaCorner ... c'est plus ou moins devenu mon vrai blog, sauf qu'il n'est pas en ligne... allez, quelques photos de temps en temps sur Twitter. Je me fais aussi mes petites "todo listes" dedans. Les choses à relire dans du code converti en e-book. Pourtant, une bonne partie des 'todo items' auront besoin de repasser sur PC. Parce que vu l'heure à laquelle j'en ai fini avec la vaisselle ces jours-ci, quand j'ouvre mon portable, je suis en mode demi-zombie ... je passe de forum vide en forum vide sans vraiment avoir l'énergie de lire ce que les gens y ont mis. Q: où est-ce qu'on en est avec LevelModel, pourquoi ::SaveCommands() est vide ? Q: pourquoi avais-je introduit "MonsterGeneration"
A: cette classe apparaît en même temps que le système de tri des 'blocs' de texte pendant les liens entre objets ... sans doute une tentative avortée qui sera restée au moment du commit faute de reviewing correct du code. Q: pourquoi est-ce que je n'ai aucune doc sur EditorLevel::scanSubFile() ? [todo] Refaire un coup de -WeffC++ sur le code, et trouver les #pragma push qu'il faut pour que le code incapable de supporter 'effective C++' se taise une fois pour toute et que ça devienne le mode par défaut pour la compilation. edit: voilà. je viens de terminer d'écrire ça et mon GSM me rappelle à l'ordre façon Monkey Island: "maintenant éteignez votre ordinateur et allez vous coucher". To be honest, the "Cupido" power of Kirby's adventure is one thing that I almost never used, and certainly almost never enjoyed. But things are apparently fairly different for J.L.N-6yo, who enjoys it enough to prefer losing a life over going forward without it. Cupido has ranged attack, making the other monsters less intimidating. Interestingly, the other power he enjoys a lot is metal, which also makes monsters harmless. And I find it excellent that the same level just features them at the start of two contiguous rooms. Just as if those rooms were thought as sandboxes to have fun.with those powers. 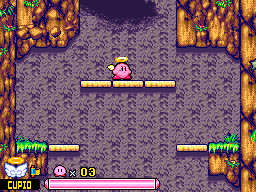 Kirby-cupidon attaque a distance. Avec lui, tous les monstres deviennent du coup beaucoup moins inquiétants. 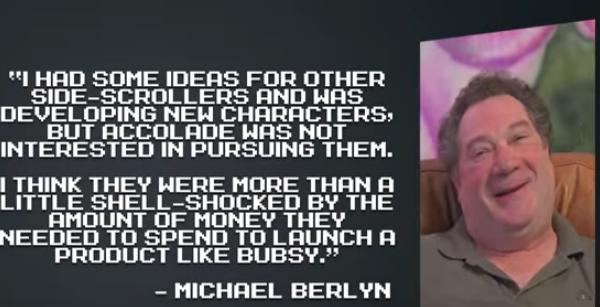 Ce n'est sans doute pas annodin puisque l'autre pouvoir qui a les faveurs de J.l.n n'est autre que "Kirby-Métal", que je trouve personnellement trop lent et trop lourd pour être agréable, mais qui passe tel un tank à travers (presque) tous les obstacles... et qui annule tout inquiétude que les monstres pourraient produire. Cupido also makes floating even simpler. Normal kirby requires you to flap with A like when Mario is swimming. cupido, once in the air, remains at the exact pixel it was until you press the D-Pad. It makes many precision challenges completely. undermined and lots of timing challenges much easier to focus on. Last but not least, the details making the arrow fun is admirable: it sticks for some seconds where it landed, including on monsters, making them look grotesque and stupid since they keep wandering around as if they didn't realised what happened to them. This is reinforced by the fact that arrows are weak compared to most other attacks, making the weakest monster need two hits. Note, too, than those sticky arrows provide valuabe feedback to the young player: it gives lots of time to analyse why a shot failed and where to move to make the next shot a hit. 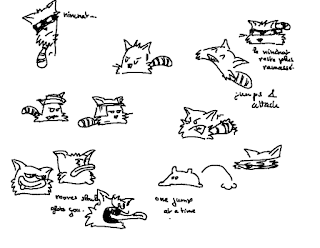 Je manque de temps pour re-blogger ici toutes les trouvailles de Sylvain "Tohad" en matière de graphisme -- d'ordinaire touchant plutôt aux décors de dessins animés (avec un penchant pour les ghibli, en ce qui me concerne) ou au concept art de futurs jeux vidéo. 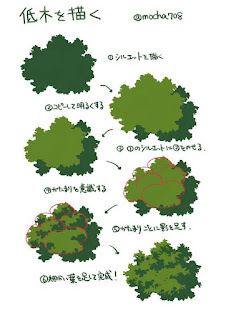 Mais là, vu le temps considérable que j'ai passé moi-même à chercher des références pour dessiner les arbres, je peux difficilement passer à côté de ce tutoriel épattant de Mocha. 'faudra que j'étudie ça d'un peu plus près. 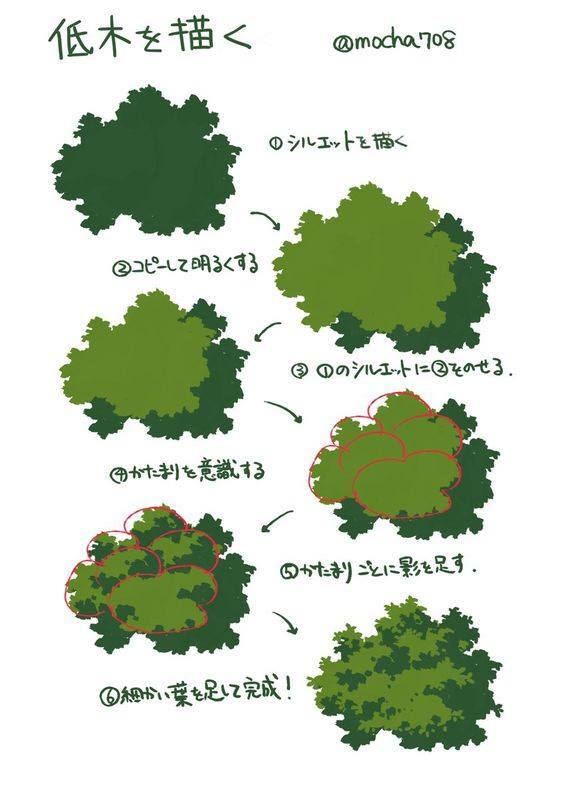 To Mocha (him/her)self: I hope you won't mind if I host a copy of your wonderful tutorial here until I'm done studying it and applying it to improve my own trees in my "green zone" game level. 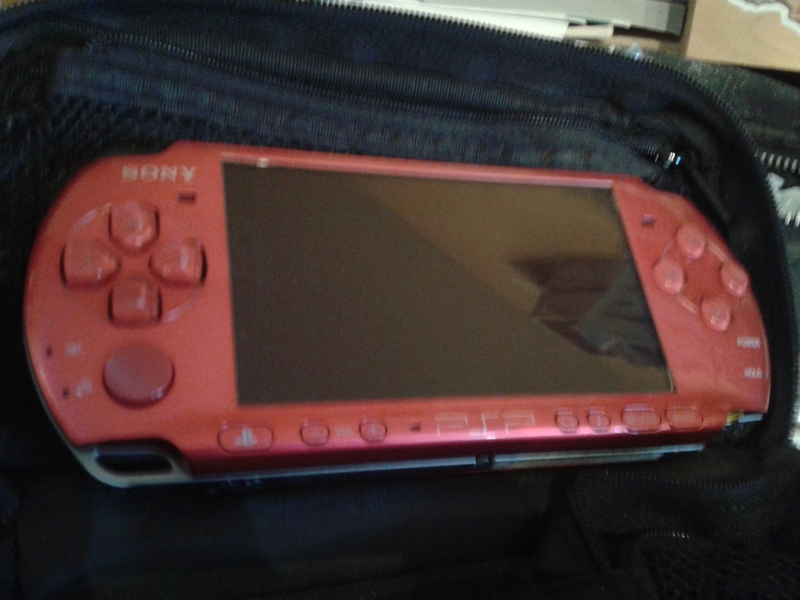 A force de faire des brocantes, mon frère a fini par mettre la main sur une PSP et une petite collection de disques de jeux, parmi lesquels Loco Roco, le jeu que j'avais envie d'essayer depuis près de 10 ans. Un concept de jeu assez sympa, mais avec un mode de contrôle que je trouve lassant au bout. de quelques niveaux. Le principe de base me fait penser à Soul Bubble : suivre un parcours, trouver des petites cachettes et faire gaffe à ses points de vie. 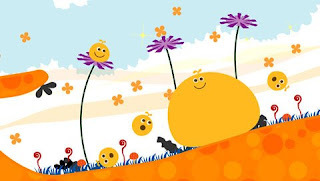 Là où Soul Bubble semblait se battre contre le hardware de la NDS, Loco Roco offre un graphisme tout en finesse et fluide à souhait. Les structures mobiles sont particulièrement réussies, mais malheureusement trop souvent utilisées comme des mini-cinématiques. Même impression pour le mécanisme "fracturer Loco Roco en plein de petites boules": il est presque toujours équivalent à un "démarrer la cinématique"... Et là où Soul Bubble offrait une mini-map du niveau et un indice sonore à proximité des zones secrètes, on navigue beaucoup plus en aveugle sur ce titre. Et trop souvent sans possibilité de faire marche arrière. Bon, venous-en an coeur du problème: on ne contrôle pas son personnage. On peut seulement incliner le niveau dans un sens ou l'autre. Et pour sauter, maintenir les deux gâchettes pour "charger" le saut puis relâcher. Le résultat est imprécis, il y aura beaucoup d'erreurs. Il faudra réessayer encore et encore. C'est le genre de chose qui devrait pouvoir se travailler, mais j'avoue ne pas avoir l'impression de m'en sortir mieux après une dizaine de niveaux. Je crois que je vais en rester là. Première question, est-ce que ce problème est déjà présent dans le fichier .elf, ou est-ce quelque-chose que j'ai introduit au moment des conversion vers le format .nds ? J'utilise pour ça l'outil objdump, et il y a déjà quelque-chose de louche: vous voyez ces vaddr et paddr ? l'une est une adresse virtuelle, que les données doivent avoir pour que le programme tourne bien. l'autre... bin c'est la première fois que je vois des valeurs différentes pour ces "adresses physiques"
Et en particulier, une de ces commandes de chargement va utiliser une adresse "physique" 4MiB plus loin que le début de la RAM de la NDS. Si je croise ces information avec la liste des sections, disponible un peu plus bas, j'ai une correspondance (grâce aux offsets à l'intérieur du fichier ELF) avec une section baptisée ".twl" -- là aussi, c'est une première pour moi. C'est en tout cas bien les bytes qui correspondent à ce qu'on trouve au bout du gouffre du fichier .nds, aux alentours de 4MiB. Renseignements pris, cette section contient des instructions spécifiques au démarrage pour DSi (et son TW Loader). Une petite mise à jour de mes makefiles pour éviter le passage par un fichier .arm9 (version pré-applatie du contenu du fichier .elf) et c'est réglé: l'outil ndstool qui construit les .nds est maintenant suffisamment évolué pour manipuler lui-même les .elf, comme dit WinterMute. Et au passage, une simple utilisation de stringstream pour des manipulations de chaînes me coutait 250K dans runMe (qui autrement ne prend "que" 500K). Voilà qui cloture (enfin) la branche "latest-devkitpro"